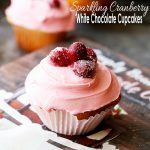 Sparkling Cranberry White Chocolate Cupcakes – Perfectly moist cupcakes filled with a creamy white chocolate ganache, and topped with a fresh berry frosting and sugared cranberries! Hello Hello! Happy Monday! We’re making it a sweet one! Which, by the way, this is my annual Share-A-Cupcake-Recipe Day. Just kidding… that day doesn’t really exist, but it should! According to my recipe index, I shared two cupcakes recipes in 2012, another two in 2013, one in 2014, and one more in 2015. Happy to say that my best one yet is in front of us, right here, right now! AND it’s not even MY recipe. LOL! Okay Okay. So I’m not a baker, but I do bow down to those who are. This stuff takes some sweet ol’ time, maaan! In the time that it takes me to make 12 cupcakes, I can cook 6 dinners + 3 side dishes. Seriously. Reality is, though, dinners and side dishes do not result in huuuuge happy smiles like white chocolate cupcakes do. Let me circle back to the O.G. of this recipe. Her name is Lindsay Conchar and she is the author of the gorgeous cookbook, Simply Beautiful Homemade Cakes. She is also the creative genius behind the blog, Life, Love and Sugar. 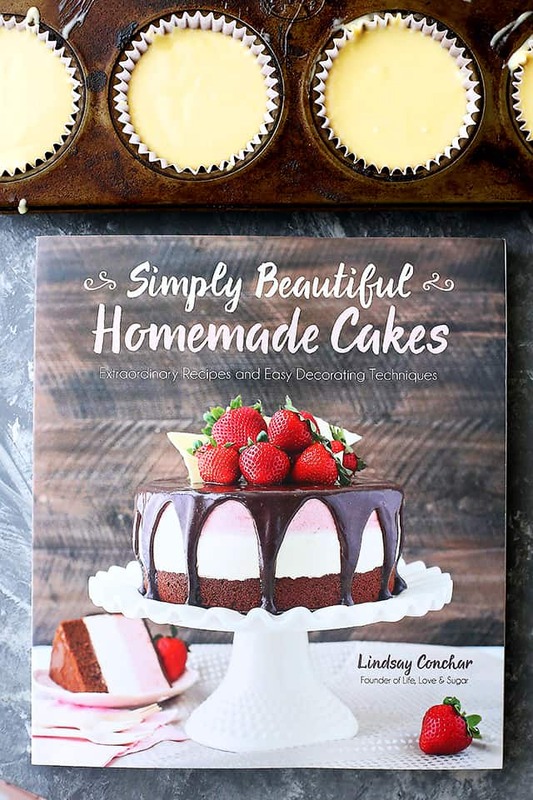 In her book, Lindsay shares 65 recipes with simple and creative cake decorating techniques, and all the cakes are stunning! In the Decorating Tips and Tutorials section of the book, she teaches how to take your cake from average to beautiful, and details all her secrets on how to get there. From how to fill and prepare a piping bag to frosting a perfectly smooth cake, Lindsay walks us through every single step. But then you add on the frosting, and on a scale of 1 to 10, they start to creep up at about 100. The frosting is with real, fresh cranberries, you guys! And then! And then you add the sugared cranberries on top and OH MAH GAH! Revolutionary! The pop of cranberry when you first bite into the cupcake is all sorts of incredible. As you continue to bite down, you get a taste of the divine fresh berry frosting, and just when you think you’re done, BOOM! White chocolate ganache meets up with your lips and the next best thing that you can do is inhale the cupcake in one large bite. Don’t fight the urge. Do I really need to continue to wax poetic about cupcakes?! I mean, really? I didn’t think so. 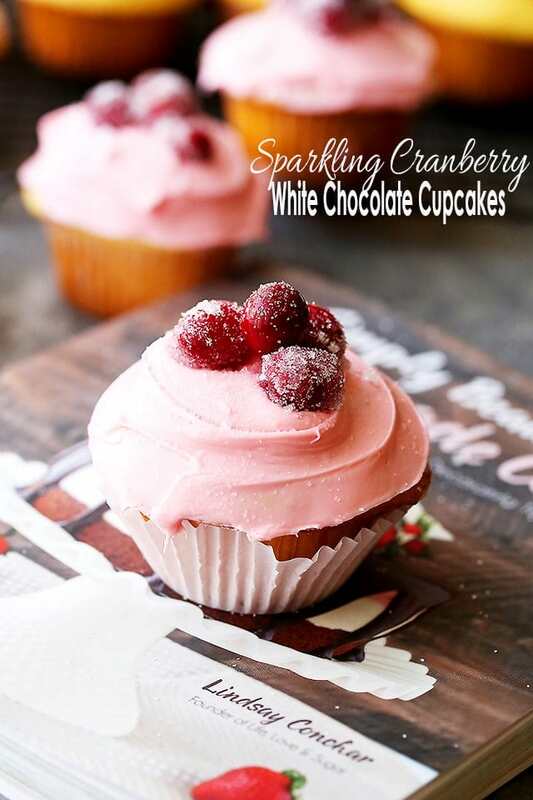 Sparkling Cranberry White Chocolate Cupcakes - Perfectly moist cupcakes filled with a creamy white chocolate ganache, and topped with a fresh cranberry frosting and sugared cranberries! Bring 1/2 cup of the sugar and water to a simmer in a saucepan; simmer until the sugar is completely dissolved. Pour the prepared syrup into a heat-proof bowl and allow it to cool for 10 minutes. Add the cranberries and stir to coat. Refrigerate the cranberries in the syrup overnight, stirring a couple times to coat with syrup. Preheat oven to 350F (176C) and prepare a cupcake pan with cupcake liners; set aside. In a large mixing bowl, cream the butter and sugar together until light in color and fluffy; about 3 to 4 minutes. Add the vanilla extract and sour cream and mix until well combined. Add 1 of the egg whites and mix until combined. Add the remaining 2 egg whites and mix until well combined. Scrape down the sides of the bowl as needed to be sure all ingredients are well incorporated. Combine the flour and baking powder in a medium bowl, and combine the milk and water in a small measuring cup. Add half of the flour mixture to the egg mixture and mix until integrated. Add the milk mixture and mix until combined. Add the remaining half of the flour mixture and mix until well combined and smooth, scraping down the sides and bottom of the bowl as needed. Fill the cupcake liners with the prepared batter about halfway up. Bake the cupcakes for 15 to 17 minutes, or until a toothpick inserted comes out with a few crumbs. 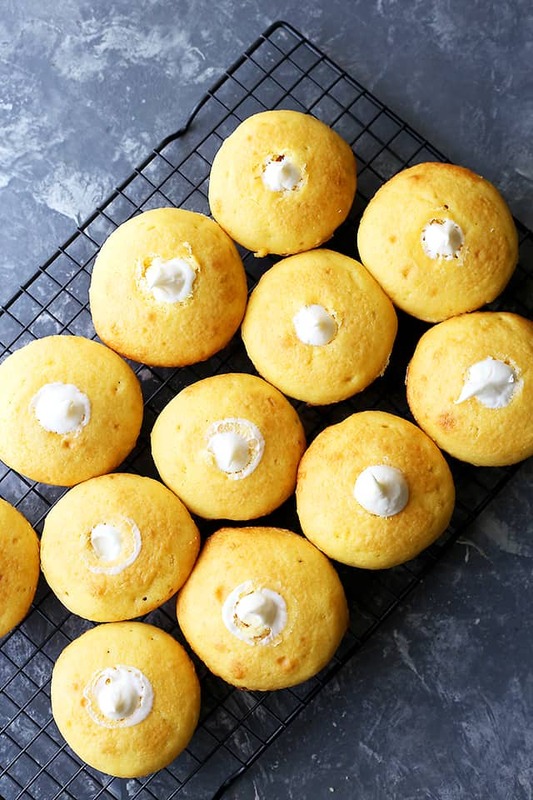 Remove the cupcakes from the oven and allow them to cool for 2 to 3 minutes, then remove them from the pan and transfer them to a cooling rack to finish cooling. To finish the cranberries, remove them from the simple syrup and roll them in the remaining 1/4 cup of sugar. You may need to roll them a few times to get a couple layers of sugar on them. Set the cranberries aside to dry for an hour or so. Combine the cranberries, 2 tablespoons water and the sugar in a small saucepan and cook over medium-high heat for approximately 5 to 7 minutes, or until the cranberries begin to pop. Remove the cranberries from the heat and set them aside to cool for 5 minutes. Transfer the cranberries to a food processor and puree. Strain the puree through a fine-mesh sieve. You will end up with about 1/4 cup of cranberry puree; set it aside. Beat the butter and shortening in a large mixing bowl until combined and smooth. Slowly add 1 1/2 cups of the powdered sugar, mixing until smooth after each addition. Add the cranberry puree and mix until well combined. Add the remaining 1 1/2 cups powdered sugar and mix until well combined and smooth. Set aside. Put the white chocolate chips in a microwave-safe bowl. Heat the heavy cream in a saucepan until it just starts to boil, then pour it over the white chocolate chips. Cover the bowl with clear plastic wrap for 4 minutes, then whisk until smooth. Sometimes the white chocolate doesn't completely melt. If that happens, microwave the white chocolate mixture in 10-second intervals, stirring well between each interval, until smooth. Set the white chocolate ganache aside to cool a bit and thicken. Use a cupcake corer to cut out a hole out of the center of each cupcake, about halfway down. Fill the holes with the white chocolate ganache. 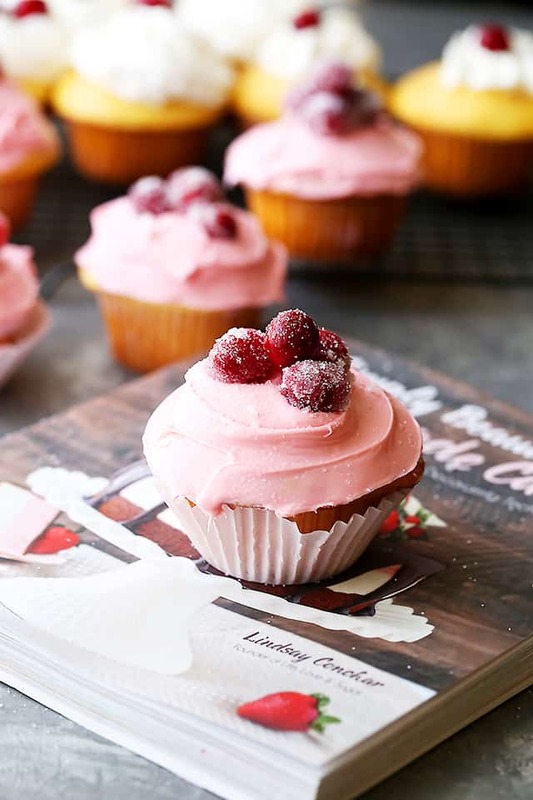 Frost the cupcakes with the cranberry frosting using the classic cupcake swirl. Leave the top center of the swirl open. Place the sugared cranberries on top of the frosting, filling in the top of the swirl of frosting. Refrigerate the cupcakes until you are ready to serve. These cupcakes are best eaten within 2 to 3 days and are best served at room temperature. Excerpted from Simply Beautiful Homemade Cakes: Extraordinary Recipes and Easy Decorating Techniques by Lindsay Conchar. Copyright © 2016. Reprinted with permission from Page Street Publishing Co. All rights reserved. These look amazing! I’m baking these for friends for the holidays. To help break up the work so I’m not doing everything in one night (I’m doing this while my 8 month old is in bed), can I make the cupcakes and freeze them until I’m ready to insert the ganache and frost them if I let them thaw really well? Thanks!!! Hi Cat!! Yes, absolutely, as long as you wait to do the frosting and the ganache. 🙂 GOOD LUCK with getting it all done while taking care of the little one!! Happy Holidays! 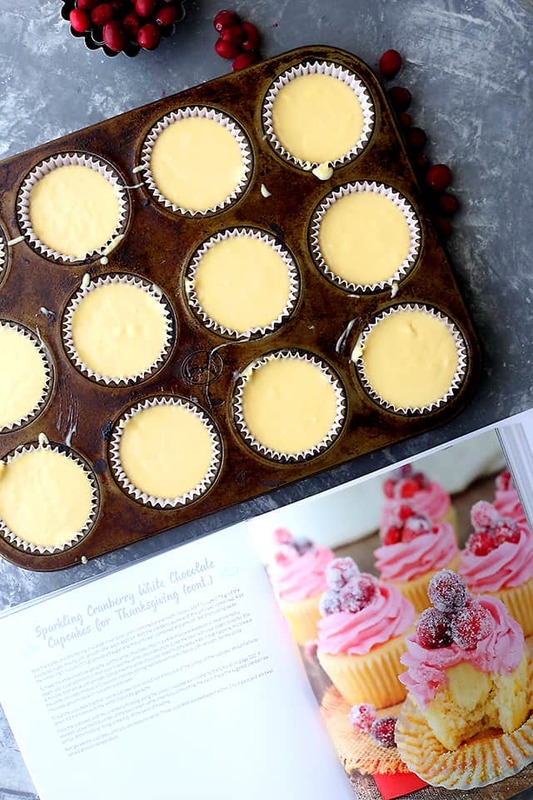 These look unreal – I need to add that cookbook to my wish list! These are so beautiful! I love how gorgeous sugared cranberries are! These look incredible! I love cranberries so much. And you hit the nail on the head – nothing puts a smile on everyone’s face like deserts. Whoa those look beyond good. They look life-changing! I love how pretty and festive these are! This looks absolute delicious! 🙂 Thank you so much for this recipe. Aww, yay! Thanks so much sweet friend! I’m so glad you enjoyed the cupcakes and I LOVE the convo in your head! 🙂 Thanks so much for sharing!